There is no standard mode for this dungeon. In expert mode the bad guys are level 72 and there are 4 bosses. You will be able to pick up a quest for the first completion of this dungeon from Maximus in the top floor of Alittu at /setwaypoint 4151 6345 – This quest awards a ranged weapon which will do nicely if you don’t have your crafted ranged weapon yet. This dungeon is HARDER than the previous PoA dungeons and thus comes in its own NEW queuing system called Featured Dungeon. 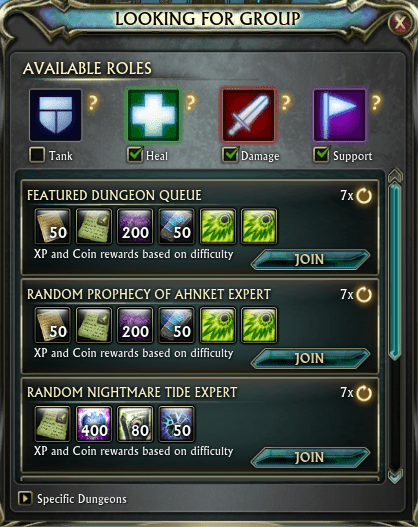 You can find this queue in the normal dungeon queue UI. 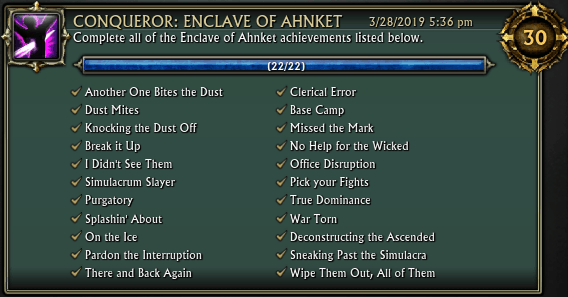 Enclave of Ahnket is currently (March 2019) the only dungeon in this new queue. 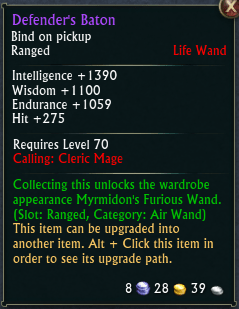 You can find infomation about the gear that drops in the dungeon under the tactics section. Warning: Running this dungeon does not count towards the 25 dungeons needed for the eternal weapon questline. KBM has been updated to include tactics for this dungeon. You can find the latest download here! Make sure you close rift while you install it. For help installing add ons click here. The trash in this dungeon is considered to be very easy to kill! There is a cheevo to earn for killing all the trash, and another cheevo for letting none of the trash even see you. Pull Salasohcarv into the middle of the area and tank him there. Be careful to ensure the DPS/Heals has enough space to stand at range from the boss without pulling wisps that are floating around behind them. You may need to reposition a few times during the fight as random wisps will sometimes head towards the middle of the area. 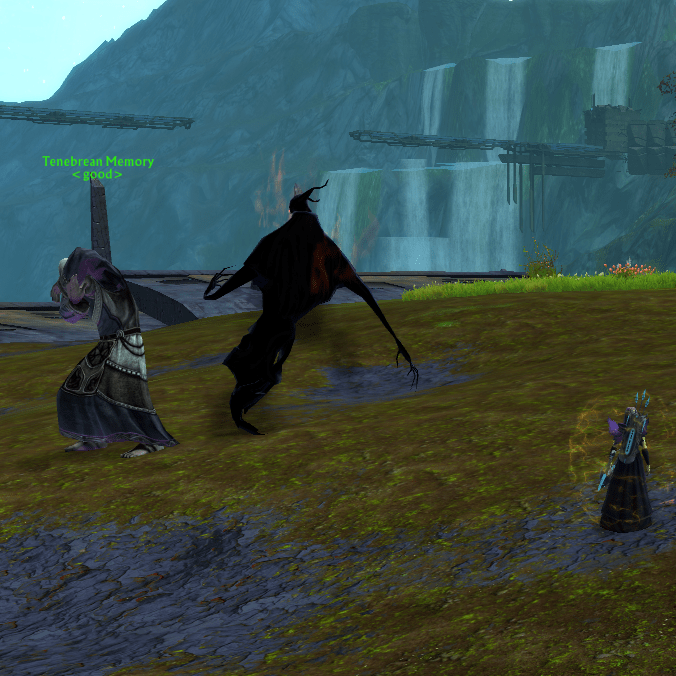 Your DPS/Heals should stand just over 8 meters away to avoid the bosses stomp ability. This is a 360° cleave that hurts a lot! Every so often a player will be trapped in a Tomb of Rock and Sand you will need to DPS it down within 12 seconds to get the player out. The main mechanic in this fight is the shield (Barrier of Earth) that the boss gets at certain percentages. Around the area will be floaty wisps, you need to pull the wisps to the boss and allow them to explode to remove the bosses shield. The shield at 80% will require one wisp explosion to remove. The shield at 60% will require one wisp explosion to remove. 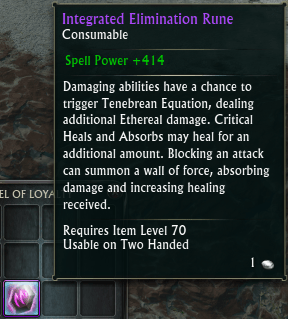 The shield at 40% will require two wisp explosions to remove. 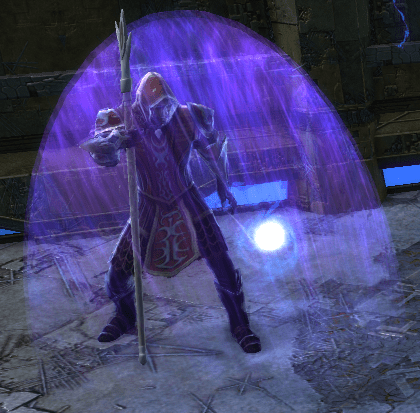 The shield at 20% will require three wisp explosions to remove. Important! 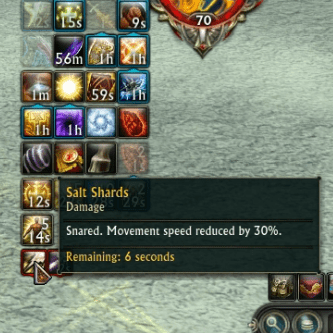 Your DPS needs to get each wisp down to 20% and then STOP DPS! At 20% the wisp will start to cast its dust bomb explosion, this is a 5 second cast, if you continue to DPS the wisp then you may kill it before the bomb cast is finished and you will not remove the shield from the boss. You need to stop DPS and allow the wisps to finish their bomb cast. Wisps hurt! Anyone near a wisp will get a stacking debuff. 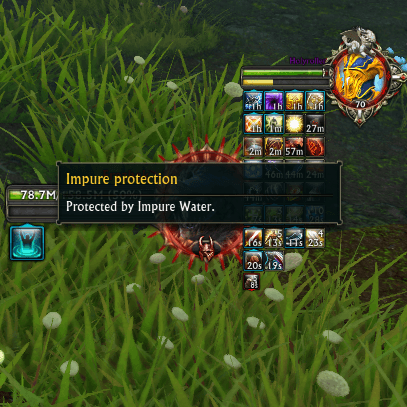 This debuff will fall off if you are not near a wisp for a short time (8 seconds). You will need to manage this debuff on the tank, only pulling wisps in when they are needed for the shield, and allowing the tanks debuff to disappear between shield phases. For a high DPS/Geared group your main issue will be NOT killing the wisps before they have cast the bomb. Let the wisp finish the Dust Bomb cast! Barrier of Earth - Shield on the boss. Let a wisp explode nearby to get rid of it. 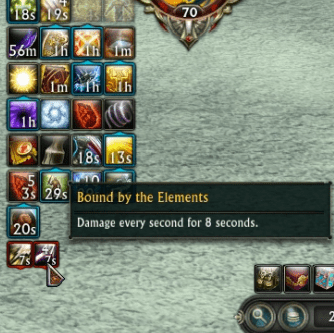 Bound by the Elements - Let this debuff fall off between wisps, especially if your tank has low health. Can be interrupted. The debuff can be cleansed. Tank the boss in the middle of the area. During the fight players will be randomly targeted with Ahnket Parasite. This player will have 20 seconds to enter a portal and kill the enemy they find inside. This enemy can be completely ignored, just go through the portal then run away before you agro the mob, go back to killing the boss. 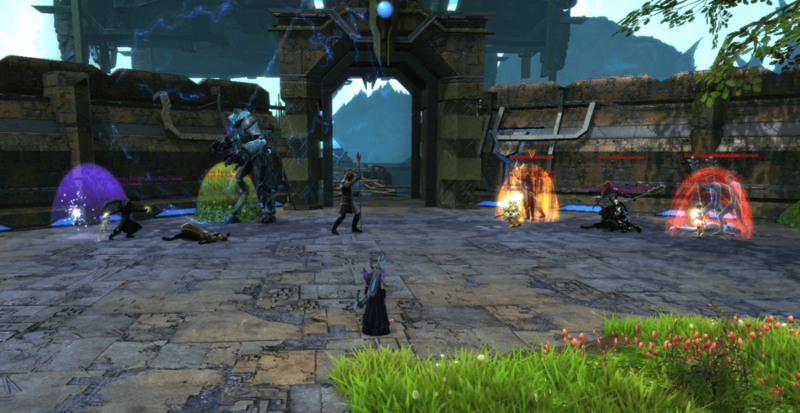 Only the player who goes through the portal can see the enemy inside, however other players in the group can lay ground AOE where the mob is to help kill it. If your healer ends up going in the portal then they should heal the friendly mob in the portal to full health instead of trying to kill the bad guy. Just before the next portal the boss will get a stack (or 2 if you didn’t kill/heal the guys in the portal) of Lingering touch. Make sure you purge this off the boss ASAP as when the boss has the buff he will radiate AoE damage which will get very painful. During the fight (after 50%) the boss will cast ‘smash’. Your healer needs to be ready with big AOE heals. DPS should spread out at range so that not everyone gets hit at the same time. find and enter the portal ASAP. The player needs to look around the area and find the portal. Run into it to enter. 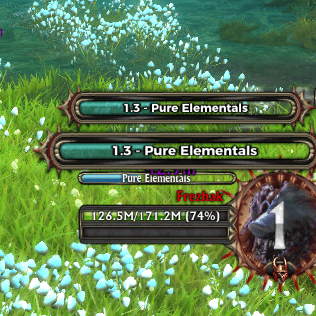 You will now be able to see the adds and either Heal or DPS them. Frezhak is stood in a shallow lake of water. The water will put a debuff on a player entering the water, if another player then enters the water then the debuff will be transferred to that player. You want the tank to end up ‘holding’ the debuff, so everyone enters the water and the tank can jump while in the water, when the tank lands back in the water the debuff will be applied back to them. 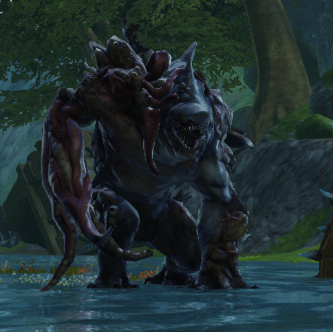 If at any point during the fight one of the DPS/Heals goes out of the water and back in then the tank can jump again to grab the debuff back. 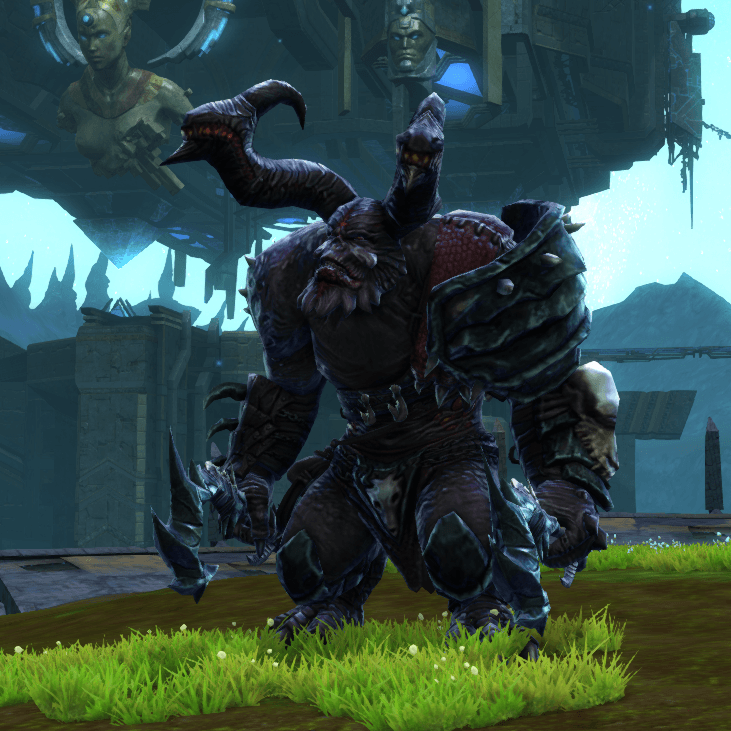 The tank will need to keep a good eye on the debuff to ensure they always have it. Frezhak will go immune and bring up a shield at 75%, 50%, 35% and 15%. This shield is removed by pulling the boss into the water spouts/pillars of light. There are 4 spots where the water spouts appear, they will appear one at a time in the same order each time. Sometimes you can keep the boss in the second water spout and it will stay there and remove all remaining shield for you. This bug is temperamental and doesn’t always work. 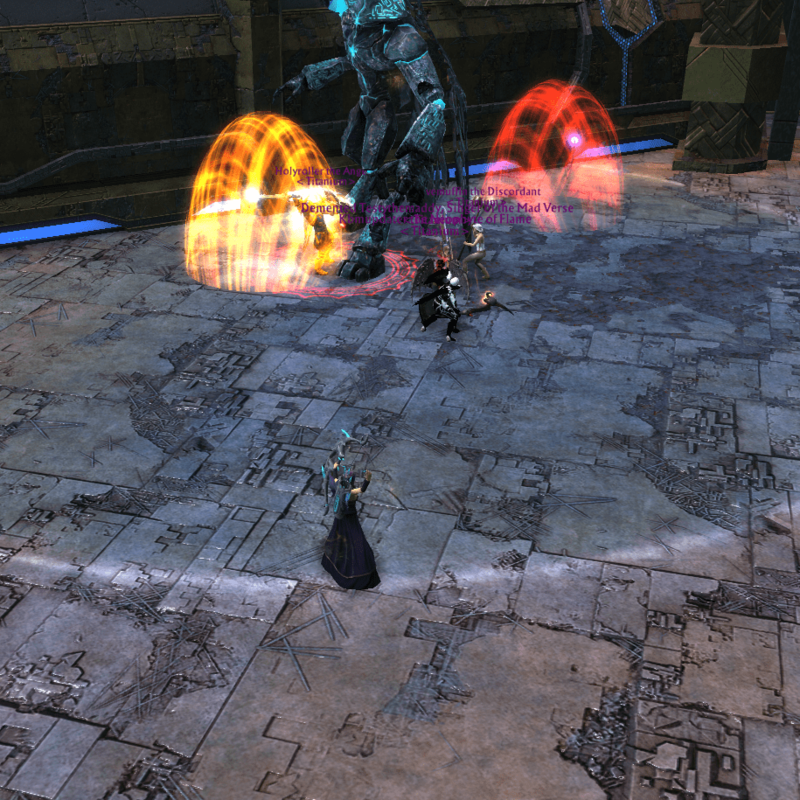 During the fight the boss will cast ‘pure elementals’. If you don’t interrupt this cast then 3 adds will spawn. When you kill these adds they will drop Frozen Cores. Players can pick up these frozen cores to get the temporary ability ‘Ice Spirit’, then use this ability to place an Ice Platform in the water. These Ice Platforms will protect you from the waters debuff, but make sure your tank jumps to regain the debuff when you enter the water again. The platforms will be up for around 30 seconds before they despawn. Impure Protection, the shield on the boss. Kill the adds to make them drop Frozen Cores. 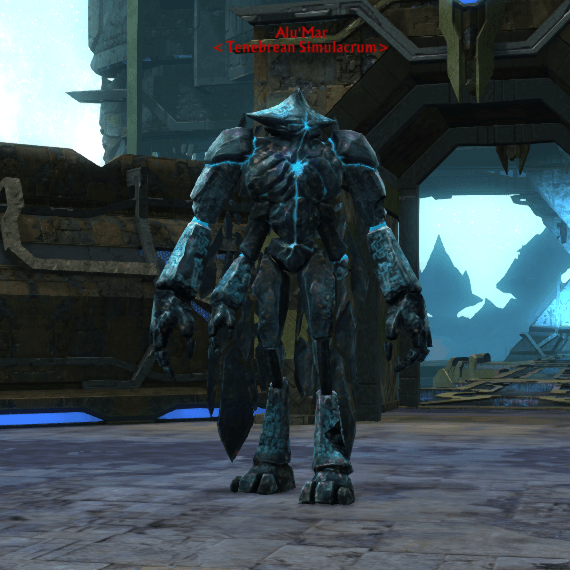 Your first goal is to get Alu’Mar to 50% health as soon as possible. At some point during this burn, 4 portals will spawn behind the boss. 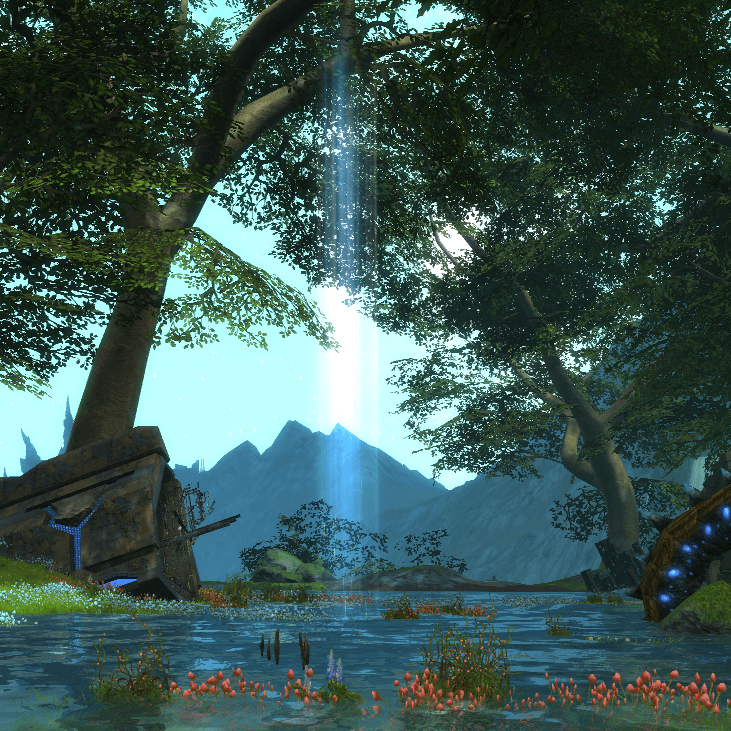 These portals will start spawning adds, your tank will need to agro these adds, most of them are ranged mobs. When the boss hits 50% he will go immune. 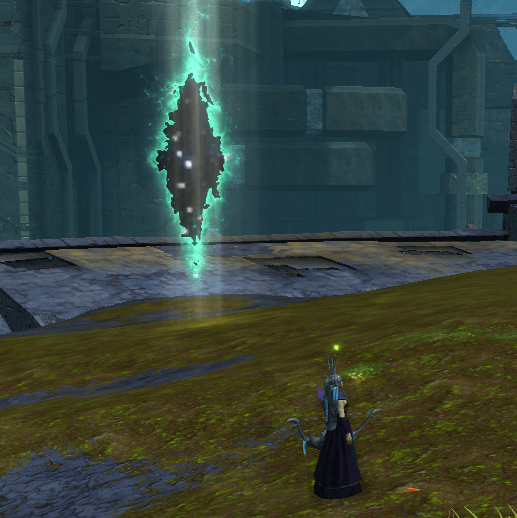 You now need to DPS each of the 4 portals down. 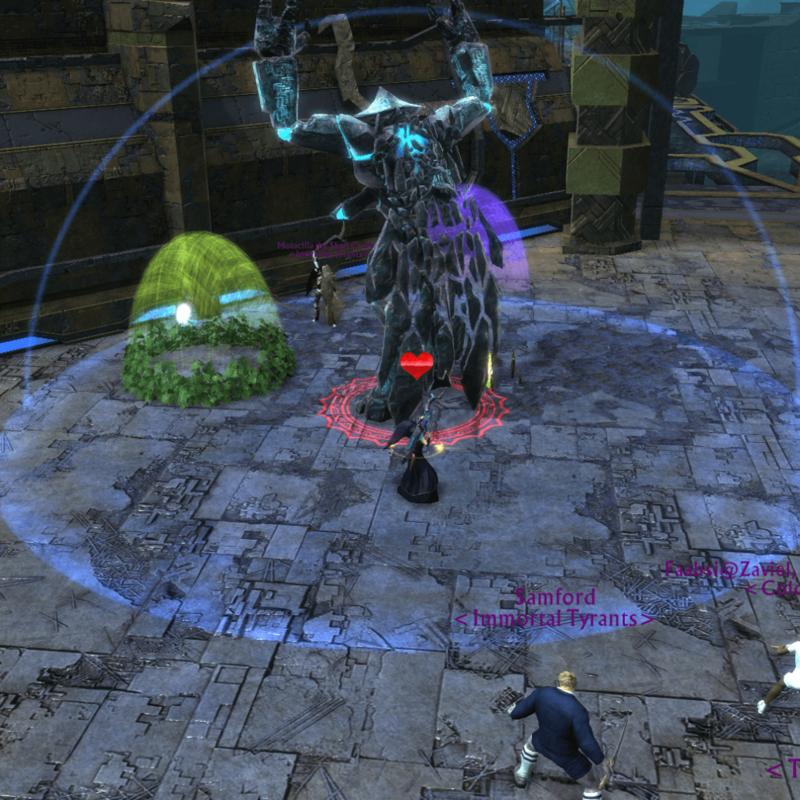 A lower geared/health group may want to experiment with killing the Dominator portal first if they find the damage taken debuff to be too painful. Each of the portals will spawn Simulacrum adds of the type associated with the portal name. You may want to kill most of these adds before you destroy the last portal so that your tank doesn’t die horribly when the bosses shield goes down. 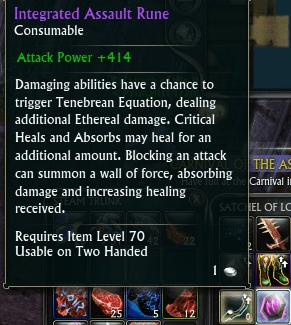 A very high DPS/Geared group can just cleave these adds down with the boss. When the last portal is destroyed, simply DPS the boss til he is dead. Disruption blast – Interrupt this. Tower Rend – Move towards and away from the boss to stay out of the red. 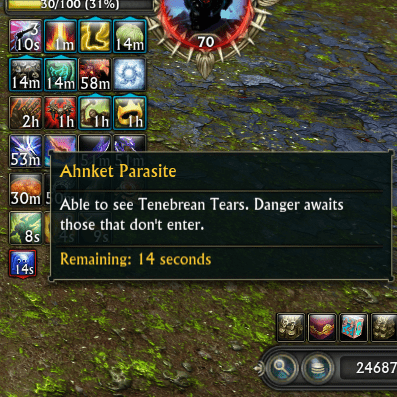 Ahnket’s Aid – A buff on the boss that stacks up when there are portals up. Purge it off. 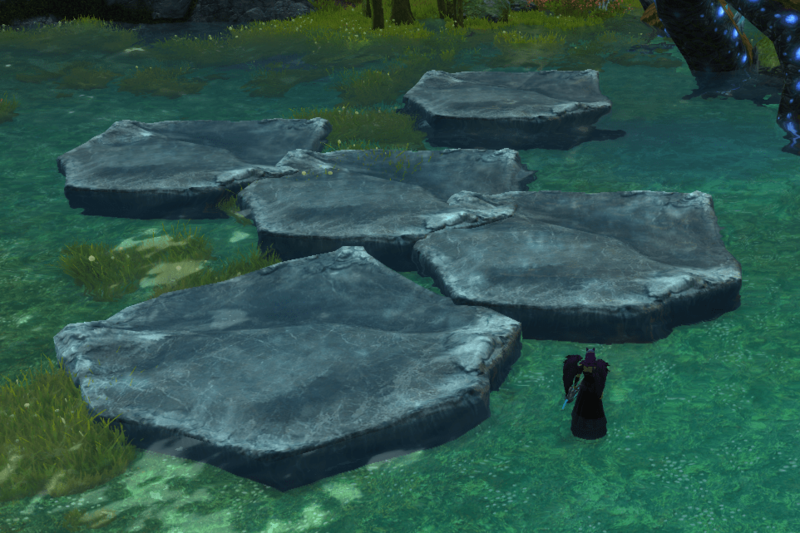 Adds will spawn from the portals. 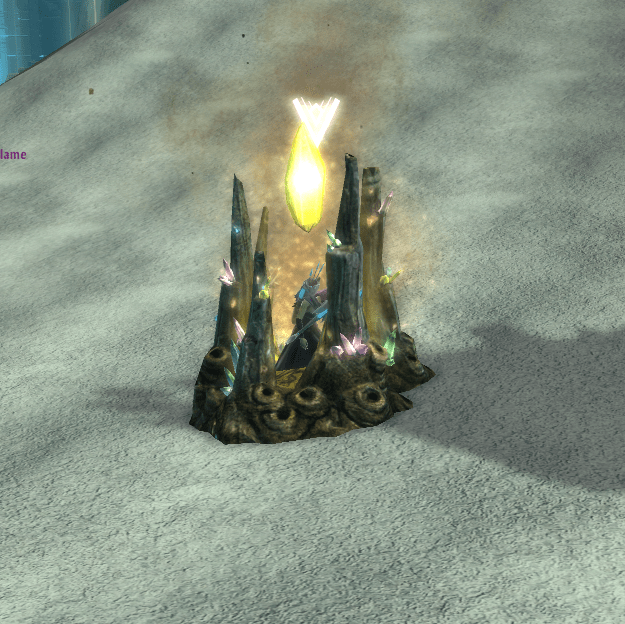 Target the little wisp inside the portal and DPS it down to destroy the portal. You should purge this off the boss. Best to overlap the Warden portal . The 4 portals will need to be destroyed after the boss hits 50% and gains a shield. 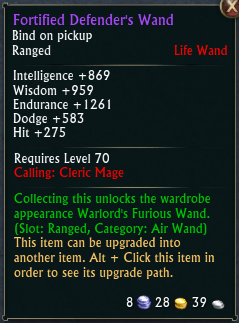 The gear that drops in the dungeon is very good for those trying to gear up for raids. 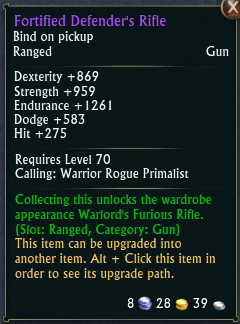 Once fully upgraded it is slightly better than LFR quality gear (dropped in TDEM). WARNING! 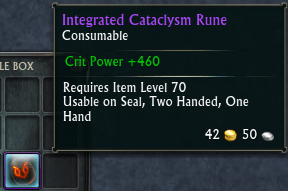 These runes will drop already attached to the gear. You will need to use a Rune Unsocketing Device to remove it from the gear and place it on the item you want. Rune Unsocketing Devices can be found in the Rift store, you will also get one free every months from the log in rewards calendar! There is a forum post here asking for this to be changed! 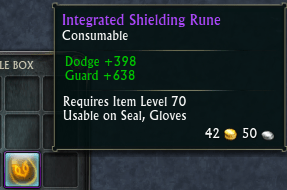 Once you have removed the Rune from your gear it will be TRADABLE. 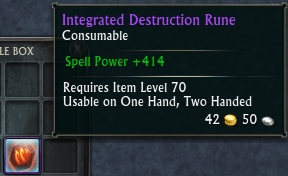 These runes are not only Best in slot to replace your current runes, but they also allow you to place runes on two extra gear items. Previous to the release of these runes players could place runes on their weapons, seal and legs. 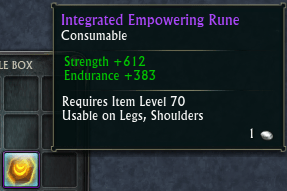 These runes add the shoulders and gloves. This quest awards a ranged weapon which will do nicely if you don’t have your crafted ranged weapon yet. However, the most important thing about this quest are the skins that are rewarded! Each item has a skin from the old PVP system, these skins are not currently available anywhere else in game. It is possible to get all the cheevos in just two runs of the dungeon, however you will need very high DPS/Heals, a competent tank and a lot of communication. The Conqueror cheevo for getting all the cheevos listed below. The best way to get this cheevo is to go through the whole dungeon and kill all the trash before you pull the first boss. 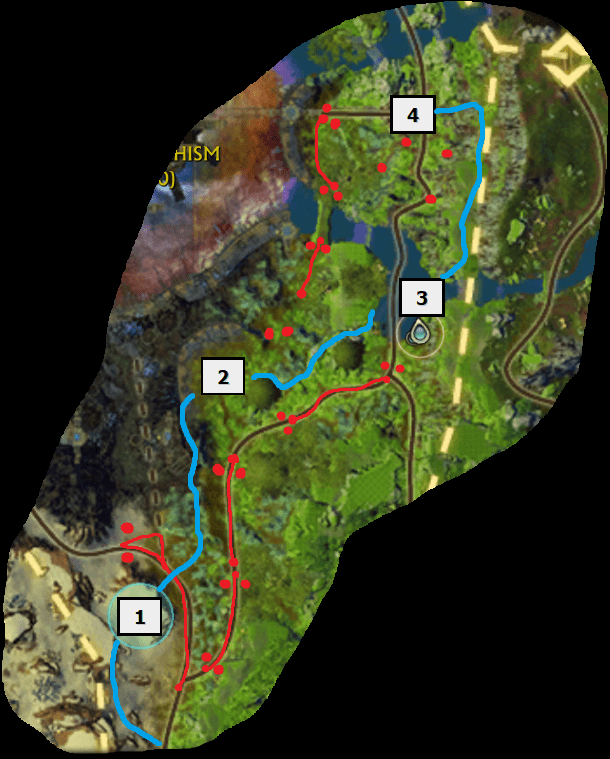 I have marked all the trash points on the map. 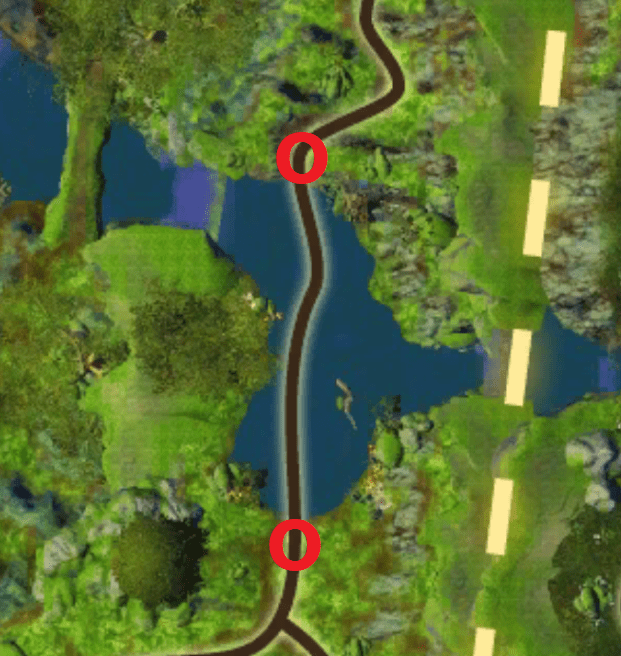 The lines are trash packs that walk a short distance on the paths shown. If you don’t kill all the trash before the first boss kill then some of the trash will despawn when you kill the first boss and you lose the cheevo. Make your way carefully through the dungeon avoiding all the trash. The trash is not allowed to even see you! 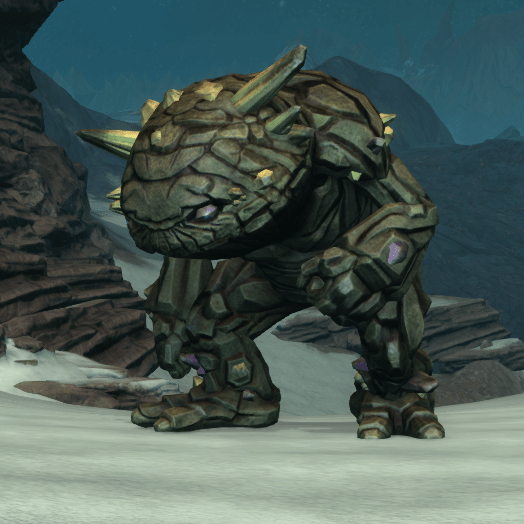 If you get too close they will agro and you lose the cheevo. I have marked the route we like to take on the map in blue. The route involves a lot of cliff climbing. Remember to dismount on the steeper inclines to give yourself better control. This dungeon doesnt have a wall around it like most other dungeons in Rift. Instead, there is a veil of fog all around the dungeon. Walking into this fog will give you a debuff that will tick damage. Allowing this debuff to kill you will pop this cheevo. The easiest spot to do this is at the entrance when you first enter the dungeon, just turn left as if you were heading into Gedlo and keep going til you die. Kill the first boss, Salasohcarv. To get this cheevo you have to destroy the minimum amount of wisps needed to kill the boss. This is 7 wisps total. 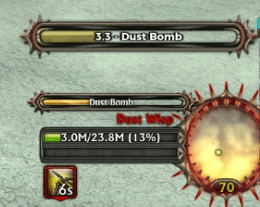 As long as you stop DPS on the wisps at 20% and let each bomb cast go off correctly then you will be able to remove each shield using the minimum amount of wisps. If you accidently kill a wisp before the bomb cast is finished, or pull in too many wisps and kill them between shield phases then you will fail the cheevo. 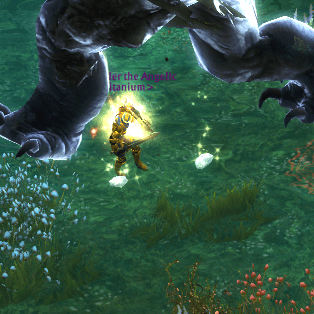 During the fight a total of 15 wisps will spawn. You will need to use 7 of them to remove the shields from the boss. To get this cheevo you will need to kill an extra 8 wisps, killing/exploding 15 in total. Make sure you dont kill all the wisps before you have the last shield down or you wont be able to remove the shield and will have to wipe. KIll Allajax the second boss. To get this cheevo you need to make sure the bad guy is dead or the good guy gets fully healed before the timer runs out. To get this cheevo, the player needs to run away from the mobs inside the portal without agroing them and go straight back to the boss to DPS again. You may find it easier to just not go into the portal at all and let the player with the debuff die and then battle rez them. I would only suggest doing this if you have enough DPS that you only need to do one portal phase. Make sure the boss is purged straight away when he get the puff at the end of the portal phase. To get this cheevo you will need to purge the Lingering Touch buff from the boss 5 times. You will need to go through 5 portal phases and purge each time he has the buff. Purging 2 (or more) stacks at once does not count as purging twice. Kill the third boss, Frezhak. 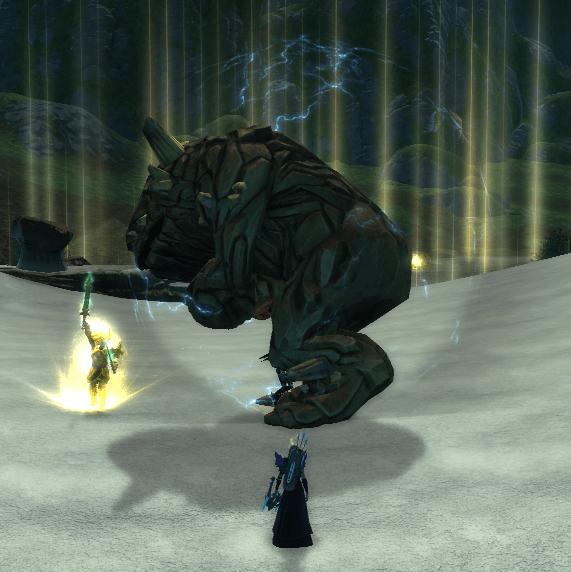 During the fight the boss will cast ‘pure elementals’. If you don’t interrupt this cast (allow it to finish) then 3 adds will spawn. When you kill these adds they will drop Frozen Cores. Players need to pick up these frozen cores to get the temporary ability ‘Ice Spirit’, then use this ability to place an Ice Platform in the water. You will need to count the platforms as you create them and only kill the boss after you have made 25. The platforms disappear after around 30 seconds, you do not need 25 platforms up all at once, just to have created 25 during the fight. Use Ice Spirit to create an Ice Platform. Ensure every cast of Aqua Jet is interrupted. Normal ability interrupts will not work on the boss. 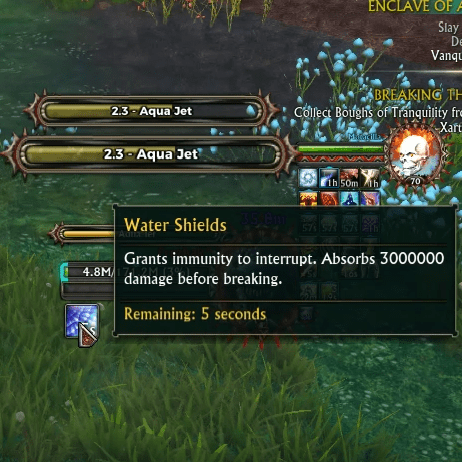 The boss will get a shield called ‘Water Shields’, this needs to be DPSed off of the boss. As long as the boss is moving then he wont cast Aqua Jet. Take the boss from one shoreline all the way to the other and then BACK AGAIN! Make sure you take the boss completely out of the water on both shorelines. The cheevo will pop when the boss is dead not during the fight. Kill Alu’Mar the 4th boss. To get this cheevo you will need very high group DPS. 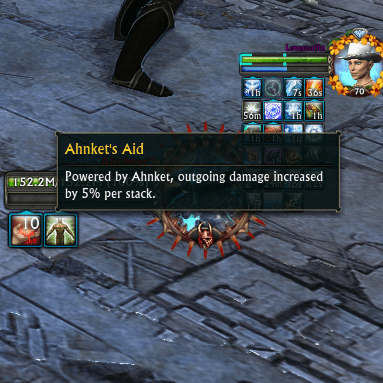 Ahnket Aid is a stacking buff placed on the boss by the portals. You need to get the boss to 50% ASAP and then destroy all 4 portals ASAP. <NOTE> The bit where it says you need to not kill a Warden is not true, it will be fixed in the next update. Note: The aim is to not allow Alu’Mar to gain the buff 7 times during the fight during the fight. He doesn’t need to have more than 7 stacks at once to fail, he just needs to have gained more than 7 of the buff during the course of the fight to fail. 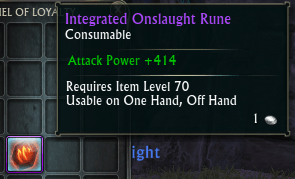 Have your purger count buffs that they purge off the boss and add them to any stacks remaining on the boss, if the total is more than 7 then wipe and try again with more DPS! We have popped this cheevo with every run so far, so its likely that it is just for killing the portals. If the cheevo doesn’t pop for you then you may want to experiment with moving the blue bubble from the boss over each of the portals before you kill them. This is the Meta Cheevo for the 4 cheevos listed on the right. These cheevos involve not killing a specific type of the mobs that spawn from the portals. We found it easier to just not kill ANY of the adds. You will need a pretty high DPS group to achieve this. We found it easiest to roll with two tanks, one Tank/Heal hybrid that tanks the boss only and one Tank with AOE taunts to take the adds. The tank that takes the adds may need to line of sight the adds every so often to encourage them to move away from the portals.